Rex Tillerson just doesn't want to talk about whether oil giant Exxon misled the public on climate change. It was a major bone of contention during his questioning at Thursday's confirmation hearing for secretary of state. Exxon is currently being investigated for allegedly misleading the public about what it knew of climate change decades ago. And Tillerson led Exxon as CEO for 10 years. Citing recent investigative journalism exposés, Democratic Senator Tim Kaine asked Tillerson whether Exxon ignored internal research going back to the 1970s on the impact of burning fossil fuels on the climate, and funded organizations that spread misinformation about the growing scientific consensus. 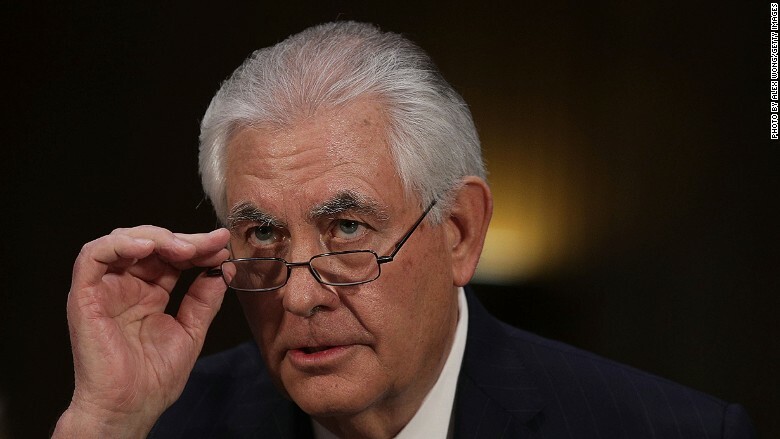 "Since I'm no longer with ExxonMobil, I'm in no position to answer on their behalf," said Tillerson, who resigned as CEO at the end of 2016 to prepare for the confirmation hearings. 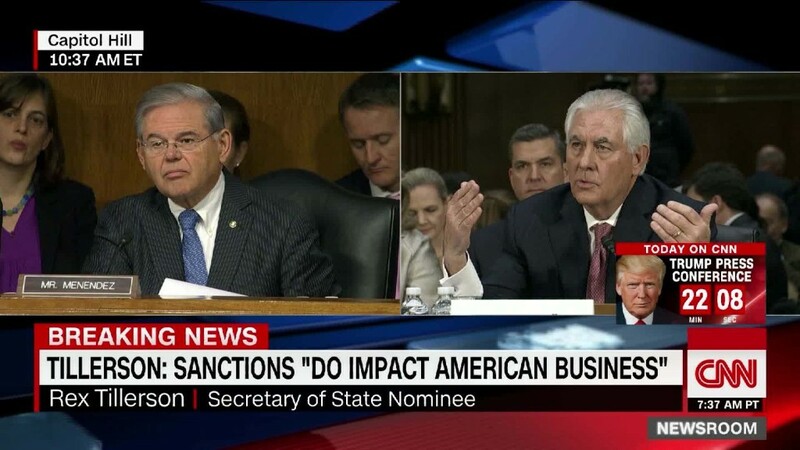 Noting the 42 years Tillerson spent at Exxon, Kaine asked whether Trump's pick for secretary of state lacks the knowledge to respond -- or is simply refusing to answer. "A little of both," Tillerson said, prompting laughs from the audience. Kaine, Hillary Clinton's 2016 running mate, said he had a "hard time believing" Tillerson lacked the knowledge. Tillerson's refusal to defend Exxon' (XOM)climate change history stood in stark contrast with his willingness to explain other actions taken by the company he worked at for four decades. Related: Can a career oil man help save the planet? The back-and-forth between Tillerson and Kaine highlighted the awkwardness of Trump nominating an Exxon man who could be representing America as its key emissary on climate issues. As secretary of state, Tillerson would have the power to negotiate a U.S. exit from the Paris climate agreement and even give the controversial Keystone XL pipeline a green light. Tillerson's hearing was interrupted several times by outburst from protesters who urged the senators to vote against his confirmation. While Trump has said that "nobody really knows" if climate change is real, Tillerson is not a skeptic. During the hearing, Tillerson said he came to the conclusion years ago that "the risk of climate change does exist and the consequences could be serious enough that action should be taken." Asked if human activity is contributing to climate change, Tillerson said the "increase in greenhouse gas concentration in the atmosphere is having an effect." However, he added that "our ability to predict that effect is very limited." Seeking to ease conflict of interest concerns, Tillerson has reached an ethics agreement that would require him to sell the $54 million in Exxon stock he owns. Exxon will also cash out Tillerson's $181 million retirement package and put it in a trust that can't invest in the company. Kaine asked Tillerson if he is subject to a confidentiality agreement that continues to be enforced that would limit his ability to answer questions, such as the ones on climate change. "To my knowledge I have no such confidentiality agreement in place, but I would have to consult with counsel," Tillerson said. Climate activists were quick to seize on Tillerson's evasive answers. "We need a secretary of state who acknowledges that the climate crisis requires bold action, not an oil industry CEO who is dedicated to spreading misinformation," May Boeve, executive director of climate activist group 350.org, said in a statement. Related: Will Tillerson get a tax break on his Exxon payout? During the hearing, Kaine read from a 1982 letter uncovered by Inside Climate News that was written by an Exxon scientist. "Over the past several years a clear scientific consensus has emerged regarding the expected climatic effects of increased atmospheric CO2," Roger Cohen, Exxon's former director of theoretical and mathematical sciences laboratory, wrote in the letter. Cohen noted the "consensus is that a doubling of" carbon emissions from pre-industrial revolution levels would cause a rise in temperatures that would "bring about significant changes in the earth's climate." Tillerson refused to answer the questions about whether Exxon downplayed or obscured the climate research. "The question would have to be put to ExxonMobil," he said. For its part, Exxon said in a statement that it rejects "long-discredited conspiracy theories that attempt to portray legitimate scientific observations and differences on policy approaches as climate denial." Exxon said that it provides funding to a "broad range of groups that support free market solutions." However, the company said it discontinued funding to groups when they took "extreme positions that were distracting from the important discussions on climate policy and/or not supported by science." "We do not fund climate denial," Exxon said.